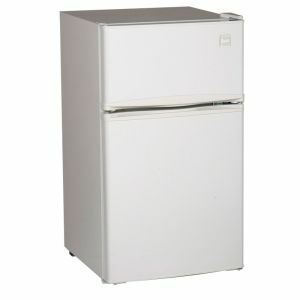 RA31B0W Two Door Counterhigh White Refrigerator is perfect for apartments, dormitories or the office. It offers a generous 3.1 cubic foot capacity, with sturdy slide-out shelves, convenient door bins and storage for a 2-liter bottle. A beverage can dispenser in the door holds up to seven12-oz. cans. The refrigerator section has a 2.1 CF capacity, while a separate 1.0 CF freezer section holds your frozen goods. Thanks to a space-saving flush back design and a recessed door handle, this refrigerator takes up little floor space, and its reversible door allows for more placement options.